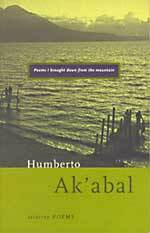 This is the first North American selection of the contemporary Guatemalan poet Humberto Ak'abal. Translator and musician Miguel Rivera has chosen 71 concise, evocative poems by this noted indigena or native poet. Ak'abal's poems, presented here also in Spanish translations made by the poet himself from the K'iche Mayan originals, return us to clear, often bittersweet realities of a war-torn yet still incredibly beautiful country: These poems speak for a people still close to the earth, whose language allows us to enter a world that still recognizes the divine aliveness of nature. Ak'abal says, "My poems have the moistness of rain . . . because they have been brought from the mountain." This much anticipated book, already being adopted by several college classes, is a rare gift that Ak'abal and Rivera have brought to English-speaking readers. Foreword by Robert Bly. Introduced by Miguel Rivera. Current price for NEW BOOK is $13.00 plus $8.00 shipping within USA, REF: aka002 (ship in usa only) Ak'abal - "Down from the Mountain"